The Chester Theatre Company presents a heartfelt and powerful tale beautifully performed in Skeleton Crew by Dominque Morisseau. The scene is deceptively simple: a break-room at an auto factory, where four longtime employees draw the audience into their professional and personal dramas. Their stories become our own, as we watch their struggle to remain true to themselves, each other and their work. Love and laughter are artfully woven into this fine play, as well as truth and tension. As always at this theatre, the performances are outstanding. Ami Brabson is a feisty powerhouse as Faye, the caring union leader. Christian Henley blazes forth as the fiery and independent Dez, while Shanita, played with joy and a kind of sweet sassiness by Margaret Odette, balances his fury. Daniel Morgan Shelley creates a convincing and realistic portrait of a man truly torn in his loyalties as Reggie, the dedicated factory supervisor. Director Awoye Timpo brings this story of human strength under duress to life in a straightforward and compelling manner. The pace of the production is lively without being breakneck, giving the fine actors room and time to work their magic. This company is blessed by an incredible team of artists who support the productions. The scenery designed by David Towlun is artfully unelaborate, revealing a well-worn common room one could see in any workplace, along with some lovely colors and plenty of realistic detail. The fluorescent lighting effects designed by Lara Dubin were incredibly true to life, and the music added by Tom Shread added so much to the contemporary flavor and down-to-earth mood. Costumes by Elizabeth Pangburn reflected the characters and situation to perfection. 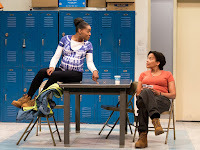 With its wonderful production assets, gripping story and fine performances, Skeleton Crew is well worth the journey to Chester, MA. Don’t miss it… only a few performances left!